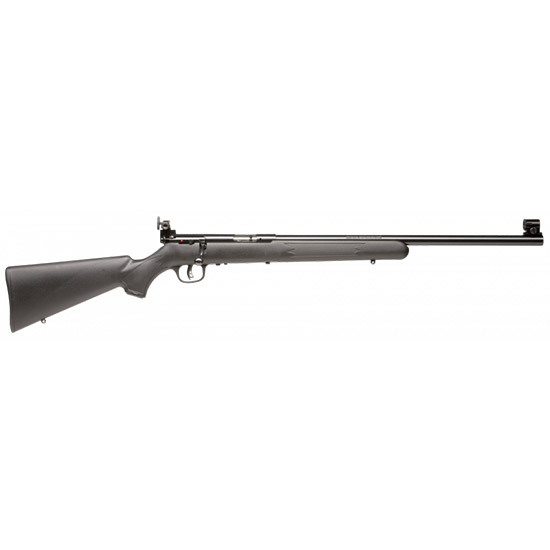 Savage 28900 Mark I FVT Bolt 22 Short|Long|Long Rifle 21 1 Synthetic Black Stk Blued in. Mark I rimfire rifles offer fun shooting coupled with safety for novices with this singleshot bolt action with oneroundatatime shooting. AccuTrigger is a standard feature offering a useradjustable trigger pull so theres no need for a gunsmith to modify it. AccuTrigger also provides a crisp clean trigger pull which enhances accuracy. The longrange heavy barrel for precision is made of blued 21 carbon steel and is set in a black synthetic stock with cut checkering and swivel studs. Peep sights featuring an aperture rear sight adjustable for windage and elevation complete the package on this oneshot wonder."